TKU/V-10, UHF or VHF all solid-state Stereo (Zweiton or Nicam Available) TV transmitter (power variety from 1KWatt to 10KWatt peak sync.) is convenient to upgrade to digital TV signal transmitter, with all solid-state circuit design and combined amplification of video/audio carrier, and provide dual high quality TV exciters (composed by Stereo TV IF Modulator and IFCU/V - TV Up converter) for optional demands, which can guarantee the reliability and stability while TV signal is transmitting. • With High Quality TV Exciters (composed by Stereo TV IF Modulator and IFCU/V - TV Up converter) and optional demands are able to guarantee the reliability and stability of TV signal transmission. 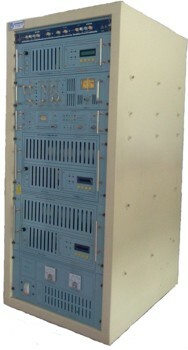 • With high-power “synthesis combiner” technology, low insertion loss, high out-of-band suppression. • New type output filter (low-pass or band-pass available). • 19” rack structure with modularization assembled frame and elegant appearance.